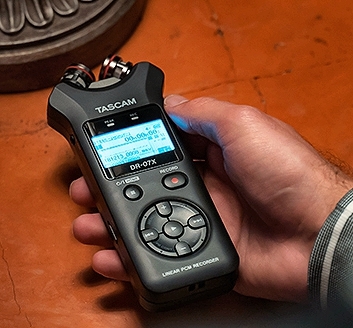 Tascam releases a new line of portable audio recorders and audio interfaces. Tascam said the smallest recorder is the DR-05X, with 24-bit/96 kHz stereo recording and two-channel USB audio interface functionality in a diminutive handheld enclosure with a bright backlit display and multi-language menus. The DR-05X uses two onboard omnidirectional condenser mics in an A/B configuration. With auto-recording, integrated peak reduction, overwrite mode and non-destructive overdubbing, the DR-05X accommodates all kinds of workflows. It has a jump-back function and adjustable playback speed. AA batteries run the recorder for up to 17.5 hours of operating time. A microSDXC card (128GB maximum) stores the audio files. The new Tascam DR-07X merges all the DR-05X’s features with a different onboard microphone array. Its mics are unidirectional, and can be positioned in an A/B or X/Y configuration. Use A/B for a wider stereo image or switch to X/Y for minimized phase discrepancies. The Tascam DR-40X is slightly larger, but it can still fit in one hand or atop a DSLR. Dual internal mic preamps with 48 VDC phantom power are fed via Neutrik XLR-¼-inch combo jacks. It boasts selectable record modes — traditional stereo, four channels to accept two different stereo feeds and dual recording for capturing the normal input and a safety take at a lower level (to avoid clipping). Extra bonus features include mid-side decoding and support for external control via Tascam's optional RC-3F footswitch and RC-10 wired remote. Tascam has two new tabletop USB audio interfaces, Series 102i and Series 208i, both with bundled software such as Steinberg's DAW Cubase (and Cubasis for iPad), IK Multimedia AmpliTube guitar/bass amp modeling and effects and T-RackS mastering software. They operate at up to 24-bit/192 kHz resolution and bring MIDI connectivity alongside analog and digital audio I/O. They also have built-in DSP with reverb, compression, four-band EQ and polarity inversion.